Are you looking for something cute and unique as a gift for this Valentine's day? 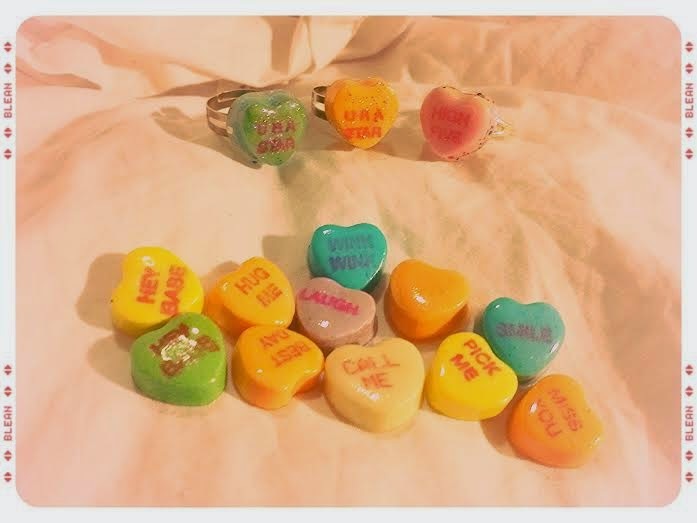 Check out my super popular candy heart rings! My love of candy quickly led me to making these and they've been one of my best sellers. I have three pairs ready made featuring a blue candy heart reading "U R A STAR"
In Orange reading "U R A STAR"
And in Pink reading "HIGH FIVE"
I buy several boxes of candy hearts and go through them picking out the best shapes and lettering. I then coat them in epoxy resin and embellish some with glitter and paint. I also have candy hearts without words, so you have the option of a plain candy heart. I have different phrases on the candy hearts (the ones in the picture are an example of some). "Hey Babe", "Call me", "Miss You", and more.